Spherical Plain Bearing GEFZ.C Series has low speed, shock and vibration resistance and is very practical. The outer ring raceway has a spherical shape and has self-aligning property, which can compensate for errors caused by different degrees of heart and shaft deflection, that is, the inner ring axis can still operate normally when it is inclined with respect to the outer ring axis. Spherical Plain Bearing GEFZ.C Series has low speed, shock and vibration resistance and is very practical. The outer ring raceway has a spherical shape and has self-aligning property, which can compensate for errors caused by different degrees of heart and shaft deflection, that is, the inner ring axis can still operate normally when it is inclined with respect to the outer ring axis. It is mainly subjected to large radial loads and can withstand small axial loads. Spherical Plain Bearing GEFZ.C Series is widely used in metallurgy, mining, petroleum, chemical, coal, cement, paper, wind power, heavy machinery, engineering machinery, port machinery and other industries. 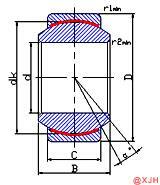 Spherical Plain Bearing The inner ring of the GEFZ.C Series is tightly fitted with the shaft. The outer ring and the housing are loosely fitted. The joint bearing can be press-fitted on the joint bearing with a press, and then the shaft is fitted into the housing together with the joint bearing. in. A press-fit sleeve (copper or soft steel) of a soft metal material is placed on the end face of the joint bearing during press fitting. The inner diameter of the fitting sleeve should be slightly larger than the diameter of the journal, and the outer diameter should be smaller than the diameter of the flange of the inner diameter of the joint bearing to avoid pressing on the cage.